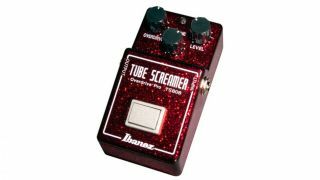 NAMM 2019: Ibanez’s iconic TS808 Tube Screamer is hitting its 40th anniversary this year, and in celebration of this milestone the company has unveiled a limited edition version of the pedal in a sparkling Ruby Red finish. Otherwise, the classic stompbox is remaining intact, both in its fully-analog circuitry and familiar three-knob Overdrive/Tone/Level layout. List price for the 40th anniversary pedal is $285.70. According to Ibanez, this "'Next Generation Tube Screamer’ has the TS808's signature mid-boost, but also the wide dynamic range and frequency response of the Jan Ray, yielding a sound that is entirely new."